Pictured, back row, from left, are Cailyn Wardrobe, Ignacia Cruz, Junior Miss Daleville Kaitlyn Boise, Teen Miss Daleville Joycelyn Tinker, Mayor Jayme Stayton, Arch Appeal owner Kailani Keels, Brass Crane Café owner Marie Wardrobe, Daleville Area Chamber of Commerce Executive Director Kecia Ham and Miss Daleville Georgia Oliver. Pictured, front row, from left, are Future Little Miss Daleville Jayden Flowers, Petite Miss Daleville Amariah Key and Little Miss Daleville Cayleigh Warren. 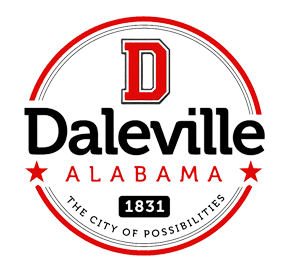 Due to a small fire the Daleville Water Department is closed today. The entire Cultural and Convention Center is closed. Operations Specialist for Alabama Army JROTC Programs Jerome Gate, standing right, speaks to the DHS JROTC about ways to improve the group’s overall look. Other officials provided words of encouragement to the students following the inspection. of Hambone’s Lawn Care, who attempted to break the group out of jail with the help of tools provided by A&C Tax Service. front, are Young Miss Daleville Skylar Thomas, left, and Little Miss Daleville Amariah Key.